MNCA: [brings a plate of tiny appetizers over] Hey, maybe this'll cheer you up. CHAN: Ooh, you know, I had a grape about five hours ago, so I'd better split this with you. MNCA: It's supposed to be that small. It's a pre-appetizer. The French call it an amouz-bouche. MONICA: I can't believe you. You still haven't told that girl she doesn't have a job yet? CHANDLER: Well, you still haven't taken down the Christmas lights. MONICA: Congratulations, I think you've found the world's thinnest argument. MNCA: I want a baby. CHAN: Mmmm. Not tonight, honey. I got an early day tomorrow. MNCA: Get up. Come on. Let's get some coffee. CHAN: Oh, ok, 'cause we never do that. MNCA: No fair. I don't even have one. How come they get two? CHAN: All right. I'll tell you what. When we're 40, if neither one of us are married, what do you say you and I get together and have one? MNCA: Why won't I be married when I'm 40? CHAN: Oh, no, no. I just meant hypothetically. MNCA: Ok, hypothetically, why won't I be married when I'm 40? MNCA: What is it? Is there something fundamentally unmarriable about me? Chandler: Yes! Good thing we have that, "Not in New York" rule. Monica: Right. Umm, listen since we're-we're on that subject, umm, I just wanted to tell you that uh, well, I-I was going through a really hard time in London, what with my brother getting married and that guy thinking I was Ross' mother? Monica: Well, an-anyway, I just...that night meant a lot to me, I guess I'm just trying to say thanks. Chandler: Oh. Y'know, that night meant a lot to me too, and it wasn't because I was in a bad place or anything, it just meant a lot to me...cause, you're really hot! Is that okay? 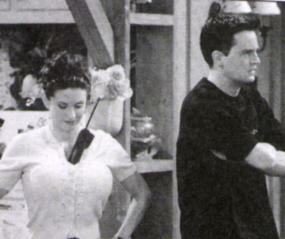 Extra add : Hey, wanna see how close Matthew and Courteney are?!? 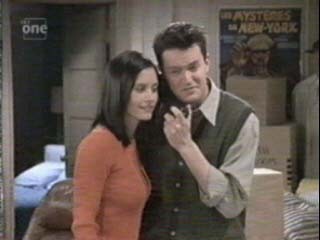 Matthew Perry goofin around with Courteney Cox OFF-screen! !